Raelee Chapman, our indie correspondent, is seeking out the vast and varied writing communities across Asia, here she chats with John Gribble, organiser of Tokyo Writers Workshop. The group goes back over thirty-five years. It was originally known as the Tokyo English Literature Society (TELS). Founded by Tom Ainley in 1977, it has always been a writers’ workshop, but in the early days the group was also active in publishing chapbooks under the TELS Press imprint, and putting out a magazine, Printed Matter. Where are Tokyo Writers Workshop meetings held? For the last few years we have met in a classroom at Nihon University College of Art in Ekoda, Nerima Ward, Tokyo. We are fortunate in that we get this site free of charge, as co-organiser Karen McGee is a faculty member at the school. The meeting actually begins a week or more in advance of the scheduled Sunday afternoon gathering. Members post pieces of work they want discussed on our Meetup page. Everyone who plans to attend can then download the work and read it in advance of the meeting. We limit the number of posters to twelve, and each poster will get twenty minutes of discussion time - usually we have around twenty attendees. Each meeting we settle in the classroom for a three-to-four hour session and midway through we take a ten-minute break. During the session proper, we follow a pretty standard format. The work is discussed in order of posting. Poems are read aloud, but there’s no out-loud reading of the prose works. During the discussion the writer remains silent, unless there’s information the group needs in order for the discussion to move forward. At the end of the allotted twenty minutes, or before, if the discussion winds down sooner, the writer may ask any questions he or she might have before we move on to the next piece. They might ask for clarification of some point, or about some issue which didn’t come up during the discussion. We discourage attempts to explain the work. Otherwise authors are free to ask about anything. The discussions are lightly moderated and depending on the piece, they may look at either global issues (structure, setting, voice), local ones (grammar, usage, clarity), or a combination. We suggest people print out copies of the works to be discussed and write their comments down. At the end of each discussion we pass these marked-up copies to the writer. We also stress respect for the writer and the work under discussion. All subjects and genres are welcome. On the rare occasion someone forgets we are a community of equals, with common goals, concerns, and struggles, the discussion gets quickly and firmly redirected by one of the organisers. Do you ever discuss work in Japanese? Is the group for expats only or a mix of locals and expats? All are welcome, but we only discuss works in English. Most of us are native English speakers. We are tolerant of non-native English writers and some of us will often spend time beforehand editing and correcting manuscripts. However, we make it clear we are not offering English lessons. Recently we added a couple of screening questions to the Meetup site to discourage people who sign up out of curiosity, but will never be regular attendees, like those looking to practice their English, or people outside of Japan. Since 2009, our main portal is Meetup. If you’re in Japan and can make it to Tokyo for meetings, you are welcome to join us. Just sign up on the Meetup site, answer a couple screening questions, and you’re in. Then you can download the material for the next meeting and post your own work. What are the future goals and directions of the writers group? I see our goals as modest, but doable: to continue on as we have been, providing an opportunity for writers to meet, share their work, and help each other along. Other than adjusting to changing circumstances, I don’t see any major changes or new directions. We are a friendly, frequently funny bunch, but serious about writing. We work hard to be supportive, especially of people who are starting out. But the point is to make the work better. Nothing is automatically “wonderful” – we don’t do overpraise. Can you tell us a little about your own writing background? And what are you currently working on? I’m a poet and sometimes an essayist. I have been publishing regularly since the early 1990s and have over a hundred journal and anthology credits. I have a Master of Fine Arts degree from Warren Wilson College, in the U.S.A. I have published one full-length poetry collection, Another Wrong Fedora, and several chapbooks. I currently have three main projects underway. First is a collaborative translation, with poet and translator Masaya Saito, of the haiku of Hashi Kanseki (1903-1992). Some of that work recently appeared in the American magazine Modern Haiku. I am completing a poetry chapbook, Ueno Mornings, which I plan to publish privately soon. And I have another full-length collection in the works, My Brother Goes Down to the Sea. I’m also slowly gathering ideas and materials for a book on playing five-string banjo. 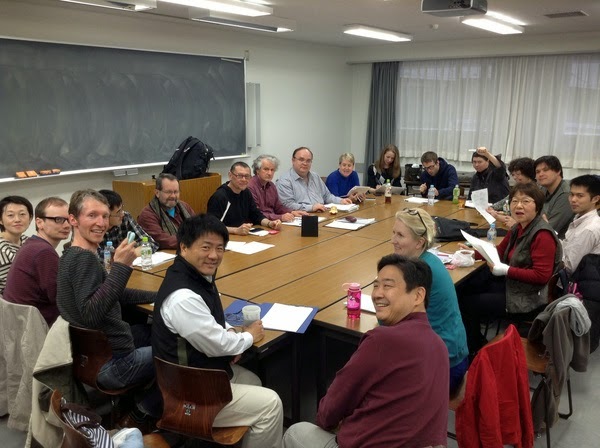 Aside from the Tokyo Writers Workshop, I am involved with an invitation-only poets group. I am also co-organiser of the annual Japan Writers Conference.